Welcome to yet another addition of The Secret Recipe Club. Every month a large group of food bloggers gather and are secretly assigned one anothers blogs to peruse and choose a recipe of theirs to make. It’s all very “hush, hush” and secrative…until reveal day that is. At that point we all get to post our recipes announcing who our assigned blogs were. From there we all join in a giant blog hop to celebrate and commiserate while hopefully making new friends along the way. It’s great fun!!! -In a large skillet, over medium high heat, brown the pork until no longer pink. -Add the garlic, ginger, salt and pepper and reduce the heat to medium. -Add the carrot, red onion, slaw mix, bean sprouts and water chestnuts. -Cook the mixture until it’s just wilted. Approximtely 5 minutes. -Add the scallions, soy sauce, rice vinegar and oyster sauce. -Continue to cook just another minute or two and remove from the heat. -Allow to cool so the mixture is easy to work with. -Using one egg roll wrapper at a time, fill with the pork/cabbage mixture, roll up and seal the ends with water. Sarah has an excellent tutorial for how to do this on her blog. Sorry that I dropped the ball with taking photos of this recipe. It’s not like me, but I was AAH-SO busy that I just forgot! (Please forgive my potitically incorrect Chinese humor). -Continue wrapping and rolling until all the meat mixture us used up. -In a large, deep sided skillet, heat several inches of the peanut oil for frying. -Carefully fry a few egg rolls at a time until golden brown, turning to brown all sides. 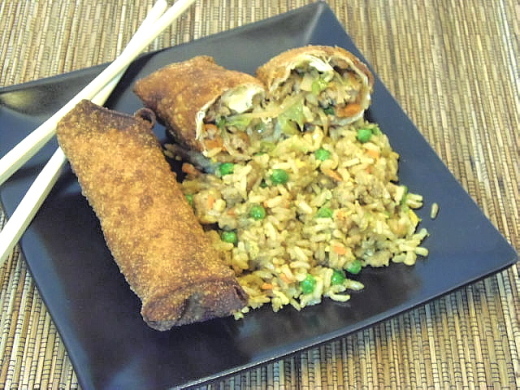 -Allow your egg rolls to cool slightly and serve. While my egg rolls were good, they were still lacking ‘something’ that our favorite Chinese take-out egg rolls have. Maybe it’s the msg? Who knows? Still, for a first time egg roll making experience, I was pretty pleased with how they turned out! Thank you very much Sarah (and Tami) for inspiring me to make these in my own home kitchen. I’ll look forward to seeing who has inspired you both this week during the great Secret Recipe Club reveal! I have always wanted to try and make egg rolls at home, these look great. yum! What a fun recipe!! I've been tempted by making my own eggs roll, but have always been too gosh darn intimidated. yours look like they turned out great! I wish I had that plate sitting in front of me now. You did a wonderful job with the recipe and I could easily enjoy a plate of your egg rolls. Happy to have inspired you to create that goodness – love all the different ingredients!! 🙂 I really never knew how easy it was to make egg rolls and I make them all the time now! Thank you for such a sweet post! I've always wanted to make egg rolls at home but have avoided it b/c I hate heating up a huge pot of oil…yours look so good I may have to try it (but substituting something else for the pork) Great SRC pick! Making egg rolls has been on my bucket list for a while now. You've given me inspiration! I haven't made egg rolls in forever, I think you have just motivate me to make some today! I love being a new member of SRC, what fun! Wow Renee, you really impress me with these fabulous looking egg rolls! Ah I've always wanted to make eggrolls too! I believe you when you say these were "missing" something though… my Chinese food inspired SRC dish was missing something too, but I couldn't quite pinpoint it. Those rolls look delicious ! Great SRC pick. So delicious, and how fun!! This was a great SRC pick! I can't believe you made egg rolls at home and they look beautiful. 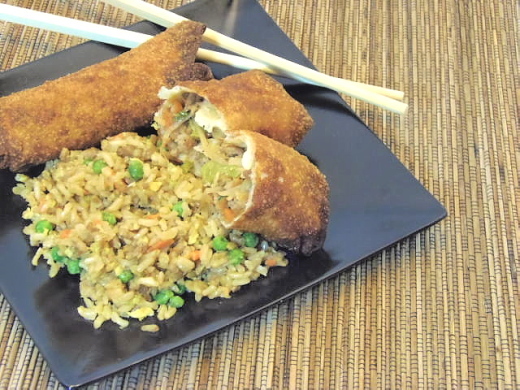 We love egg rolls and would love a recipe that mimicked our local chinese restaurant. I cracked up at your missing ingredient – MSG. haha That's probably exactly what it was – or extra grease? At any rate, yours look fantastic! Great pick! Oh man! These egg rolls look so good! Good job for making them from scratch! i always love a good egg roll. i don't eat Chinese food as much as i used to because i can't find a good restaurant where i live – maybe making my own is the answer…? Yummy! These look like they came from a restaurant!! !